Here I'll explain how to install the Harmonic Cyberstream SAT-1 card (a PCI card for DVB data reception by satellite) for use with Europe Online (EON). Other Internet by satellite providers use a similar setting. Note: This card is no longer available and no longer supported! 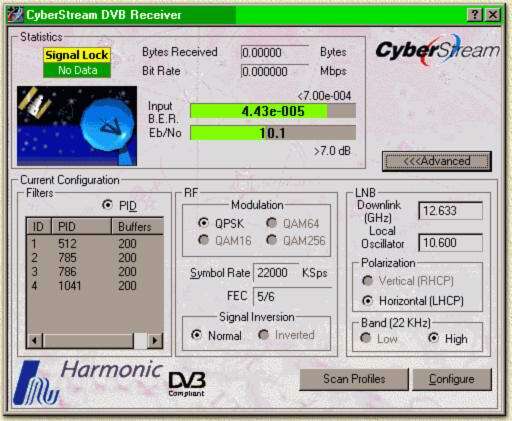 This guide is good to start working with the combination of Europe Online and the Harmonic Cyberstream DVB card, even in combination with SuperWeb ! The very positive side of this card is that it's cheap and simple to use. SNMP IS NOT REQUIRED FOR EUROPE ONLINE ! The manual of the Harmonic card states that SNMP might be required by your provider. The Europe Online service does NOT need the SNMP. NOTE: the Harmonic Cyberstream does not support TV. Note: Setup on these pages are based on Windows 9x and will work in a similar fashion on other Windows versions (if a driver is available). Where I refer to either "Harmonic" or "Cyberstream" you should read "Harmonic Cyberstream SAT1". !!! DO NOT SWITCH YOUR COMPUTER ON UNTIL STEP 7 !!! Check, just to be sure, that the card is inserted correctly and not like often happens slightly tilted or not pressed far enough into the slot (the golden contacts on the bottom of the card, should not be visible). Connect the antenna-cable of the dish gently to the DVB-card. The centre pin of the connector used is simply the same wire used inside the antenna-cable and therefor not very strong. Be gentle! Fortunatly the connector is located very good, so connecting this will not be a problem. Note: whenever you disconnect or connect the antenna-cable: MAKE SURE THE POWER IS OFF ! As soon as Windows (Windows 95, 98, 98SE, ME, 2000) starts, it will come up with a notification that it found a PCI device (the DVB-card). The next pictures illustrate this, using Windows 98 SE (Second Edition). Other Windows version will show similar dialogs with the exception of Windows NT. After the reboot, the Harmonic Cyberstream installation procedure will start for additional software tools. Just confirm all questions with a click on the "Next" button. When the "Finish" button appears, it will ask you to reboot once more. You MUST reboot otherwise you will get an error-message. Note: you might get an "unsupported browser" error. Don't worry we'll fix that automatically. In this step we will start checking all settings to make sure it all works. In the systray (there where Windows put's the little clock - in the lower right part of the screen) you will see the signal indicator of Harmonic ( ). GREEN means GOOD SIGNAL and DATA RECEPTION. Here you can do your transponder/Astra settings using the values shown on the transponder page. To get the view shown above click the "Advanced" button. To configure a different transponder click the "Configure" button. The value fields can now be altered. The screenshot above this text might be different from what you are seeing on your screen. If this is the case, then please use the right mouse button to click on the Cyberstream application. A popup-menu will appear where you can select (amongst others): "Display downlink" and "View Decimal". Please do so in order to match the screenshot. PID's can be added manually by clicking with the right mouse button on the PID table. The upcoming popup-menu allows you to select the option "Add PID". Make sure you entire the right value here (check if this should be heximal or decimal numbers). Do not alter the "Buffer" value, it's set just right by default. Note that most settings might have to set differently if you want to use a different transponder. First try using the default settings (transponder 113). Once you have found a good setting, for example for transponder 113, then consider using profiles. A profile stores the settings of a specific transponder offering you more comfort when switching transponders. You can save a profile by clicking the systray indicator (that is the colored M&M in the lower right corner of your monitor indicating the signal status) with the right mouse button. Choose "Save Profile". In upcoming window click "Save". A file save dialog will now appear and will ask you for an appropriate file name, for example "EON113.INI". Repeat these steps for the other transponders (114, 115 en de 103). Using "Load Profile", found in the same menu where you found "Save Profile", you can retrieve transponder settings, saving you a lot of work and patience. Start the dialup adapter you wish to use for the Internet Service Provider. Change network settings for use with Fazzt. For you to able to use the Fazzt offline download system, you MUST change the default IP-address of the Harmonic card. Let's check some settings for this card by clicking with the right mouse button on the "Network Neighborhood" icon on the Windows desktop and select the option "Properties". Look for the "TCP/IP -> Harmonic DVB Network Adapter" and click it once with the left mouse button.